• U.S. monetary policy is currently much looser than it should be based on the Taylor Rule. • There are several key abnormalities in the current economic cycle. • Deutsche Bank’s chief economist believes that the U.S. economy is strong enough to digest a 0.25 percent September rate hike. In a new report, Deutsche Bank chief economist David Folkerts-Landau discusses the timing of the highly-anticipated Federal Reserve rate hike and how the coming tightening cycle is far from typical. The uniqueness of the current economic situation makes it hard to predict what the Fed will do, but Deutsche Bank believes that a September move is likely. Given the current economic conditions in the U.S., including inflation and employment data, the Taylor Rule dictates that the current Fed funds rate should already be about 2.5 percent. 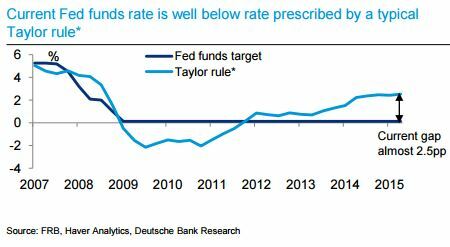 In fact, based on the Taylor Rule, the FOMC should have begun raising interest rates back in late 2011. Instead, the gap between the Taylor Rule’s projected rate and the actual Fed funds rate has been growing for nearly four years now. In addition to historically low interest rates, the Federal Reserve’s balance sheet now sits at about $4.5 trillion, more than five times its pre-crisis size. “Considering both the Fed funds rate and expanded balance sheet, current monetary policy is the furthest from normalised on record,” Folkerts-Landau explains. The case against a September rate hike includes lackluster inflation and wage growth data and the unusually high mix of part-time employment in the economy. 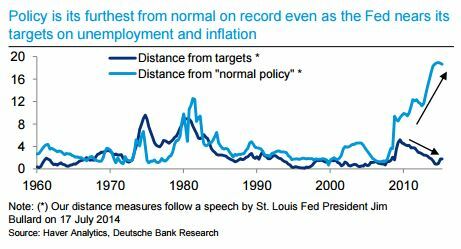 However, Deutsche Bank does not believe a September rate hike would be a policy mistake. “The economy has amble momentum to withstand a 25bps hike, and a hike would be a validation of the economy’s progress over the past seven years,” Folkerts-Landau writes. He adds that the Fed’s expected gradual pace in raising rates will provide extra assurance that the move will not weigh too heavily on U.S. economic growth.